Dustin Poirier was not too excited about Brandao's veiled threats before UFC 168. It turns out that Dustin Poirier wasn’t mad about Diego Brandao missing weight after all. It wasn’t something completely different, yet not entirely unrelated to it. In fact, the moment in question did happen during the UFC 168 weigh-ins, and involved a rarely seen assault threat. 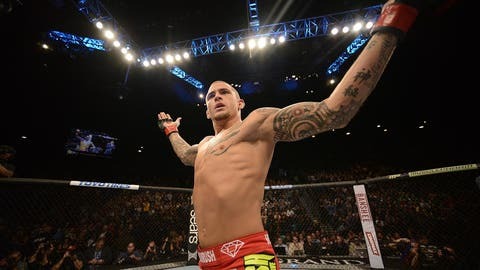 "Actually on stage I was so mad because before we walked on stage to weigh in he told me he was going to stab me in the neck," Poirier told the media on Saturday night. "They had to separate us. The guy’s nuts. That’s why I was so upset." Poirier got the final word in on the short-lived rivalry, it seems, after battering Brandao en route to a first-round knockout in the night’s pay-per-view opener. The No. 6 ranked Poirier, who said he would like a rematch with Cub Swanson next, turned it on in the last minute of the round, stinging Brandao with a left hook and then finishing him with strikes on the ground. Poirier also received 12.5 percent of Brandao’s fight purse after the Brazilian was fined for missing weight when he checked in at a final number of 151.5 pounds, more than five pounds over the divisional limit. After Brandao weighed in, Poirier angrily fired some words at him, getting in his face and riling up the crowd. That penalty made Poirier happy enough to fight, but it seems that perhaps his pre-fight exuberance was too much for Brandao, who crossed a line if his alleged comment is true. UFC president Dana White said he later had conversation with Brandao that proved that he has some growing up to do. "I talked to him after the fight, he told me a lot of personal things," White said. "It just sounds to me like he needs to get his head together. He needs to make serious decisions in his life if he wants to continue to be a professional fighter. And he knows it, too, so we’ll see what he does."